Set in the Texas wilderness during the late 80s, Prince Avalanche focuses on the relationship between two road workers, Alvin and Lance, who are repairing a highway that has been destroyed by a forest fire. The two characters initially appear almost diametrically opposed: Alvin (Paul Rudd) is a staunch, self-aggrandizing outdoorsman who loves the harmony of nature, much preferring to bask in its secluded glory than face the bustle of city life; Lance (Emile Hirsch), on the other hand, is a bumbling perpetual adolescent who gives little thought to anything besides his own immediate pleasures and sees only tedium in the natural environment. What is to Alvin an important duty and opportunity serve his fellow man is to Lance just a dead-end job. They, unsurprisingly, rub up against each other. The short-tempered and finicky Alvin is constantly aggravated by Lance’s arrogant idleness and over-zealous sexual bravado that transparently masks a childlike naivety. Lance, in turn, is able to deftly undermine his affected sage-like persona with a single blunt remark. The early passages of the film are full of screwball-style bickering between the pair, as they argue over what to play on their cassette player (Alvin wants to better himself by listening to German language instructional tapes, while Lance just wants to fend off boredom by listening to rock music) or whether it is necessary to keep old comic books in mint condition. However, they gradually open up to each other and form a friendship based on shared feelings of disillusionment and bruised pride. 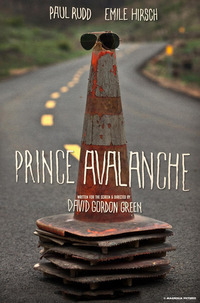 Although Prince Avalanche places at its centre an odd-couple male dynamic not dissimilar to the one featured in Pineapple Express (2008), director David Gordon Green's first foray into mainstream comedy, here the material is approached with the lyrical-naturalist style that marked his early features (such as George Washington , All the Real Girls  and Undertow). The humour is gentle, the plot meandering and the pace languorous. The subtly intricate sound design and Tim Orr’s rich widescreen cinematography create a palpable sense of the surrounding environment in a manner that refrains from seeming obtrusive or heavy-handed. The action is frequently intercut with lingering shots of the charred landscape, natural noises are foregrounded, and the actors are regularly placed as small figures within painterly compositions. While either character could have easily fallen into caricature, both actors manage to effortlessly maintain a sense of naturalism and pathos. This allows the viewer to sympathise with them even when their behaviour is less than admirable. There is a strong undercurrent of melancholy running through the film, but this is, unlike in Green’s early work, nicely offset by levity. Prince Avalanche is modest in its ambitions, but it is rare to come across such an even-handed and quietly affecting character study. This review was published on October 31, 2013.